The renewables sector is creating jobs at a rate 12 times faster than that of the rest of the U.S. economy, according to a new report. 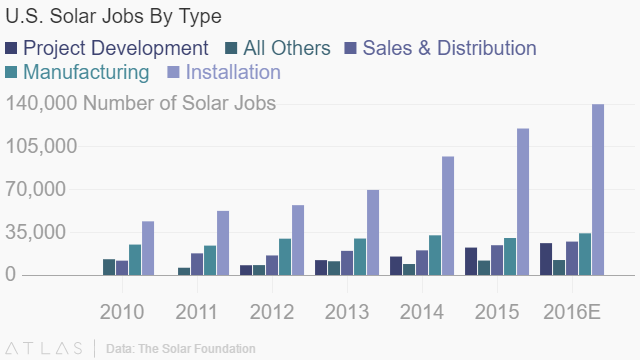 Solar and wind accounted for almost as many jobs as the entire U.S. oil industry in 2016. President Trump’s position on energy and environmental issues may slow the rapid increase in high paying renewable energy jobs, but market forces are likely to promote continued growth. This study performed by the Environmental Defense Fund’s (EDF) Climate Corps program shows that solar and wind jobs have grown at a rate of about 20% annually since 2011, and “Wind Turbine Technician” is now the single fastest-growing profession in the U.S.. Sustainability careers collectively represent 4 million jobs nationally, up from 3.4 million six years ago. The rapid growth of the Renewable Energy and Energy Efficiency sectors has been fueled largely by significant reductions in hardware manufacturing and installation costs, as well as federal, state, and local rebates and tax credits. The EDF report suggests that the cost of producing solar PV panels has dropped 72% between 2010 and 2015. The EDF Climate Corps also notes that average wages for solar workers are above the national median of $17.04 per hour, and that energy efficiency jobs pay almost $5,000 above the national median annual salary. Many of these jobs are well suited to middle class, blue collar workers transitioning from other industries and don’t require a college or advanced degree. One of the most surprising findings of the EDF report is that 70% of the 2.2 million workers in the Energy Efficiency sector work for companies with 10 employees or fewer. Because many jobs in energy efficiency and solar are in installation, maintenance and construction functions, these jobs cannot be outsourced and contribute significantly to the growth of local economies. Despite the growth of jobs in renewable energy, President Trump has called for an increase in fossil fuel production as part of his plan to be the greatest job creating president ever. This tack runs directly against the market forces shaping the modern energy market, as jobs in fossil fuel extraction and support services have slumped since 2012 with a compound annual growth rate of -4.25%. The U.S. Department of Energy (DOE) released a separate Energy and Employment Report days after President Trump’s inauguration suggesting that the solar industry now employs more people in the Electric Power Generation sector than coal, oil, and natural gas combined. Oil, however, employs a few thousand more employees than the renewable sector when including jobs related to fuel extraction, transmission, and distribution. It is likely that Trump’s plans to eliminate environmental regulation and cut research in renewables will add new jobs in the fossil fuel industry. However, market forces suggest it would be difficult to completely stop the trend toward renewables and energy efficiency. The DOE report still predicts that energy efficiency employment will grow by 9% in 2017 under the Trump Administration. Microinverters vs. Regular (String) Inverters: What’s the Difference? When Are Solar Panel Carports Worth It?